Hand washing is important. We go through our days touching doors, handrails, and shopping carts. We shake hands and high five. We flush toilets and read waiting room magazines. Do you know what could be on all that stuff? Just wash your hands, people! Not like every five minutes or anything, but maybe before you put your grubby little fingers all over those McDonald’s french fries. Because if you don’t, you will die! Too far? These guys seriously had to wash or die. It wasn’t just a passing comment; the Lord said it twice. “Wash your hands and feet so that you will not die.” Not catch a cold. Not get the flu. No… die. I guess God really wanted the priests to be clean when they entered His presence. It makes sense, right? God is clean and so if we are to be in His presence, we are to be clean, too. The good news is that elaborate hand and foot washing isn’t necessary for us to be in God’s presence. We don’t need a gold basin filled with water. We don’t need washcloths and towels. We just need repentance and we just need Jesus. Jesus is the wash basin through which we are cleaned and repentance is our response to the wash basin. We recognize that we have dirty hands that need to be cleaned. Jesus cleans. And because of his love for us poured out on the cross, we are made clean. If you don’t wash your hands you might catch a cold. But unlike Aaron, you won’t die. Jesus has already done the washing. Receive in it. Bathe in it. Thank Him for it. Be clean! Zechariah 13:1 On that day a fountain will be opened to the house of David and the inhabitants of Jerusalem, to cleanse them from sin and impurity. Sometimes when my kids walk into the room, my wife looks at them and says, “you need to go take a shower.” It’s not that they don’t bathe regularly, it’s just that some days are stinkier than others. Those are the days where you want to grab a hose and take care of business. 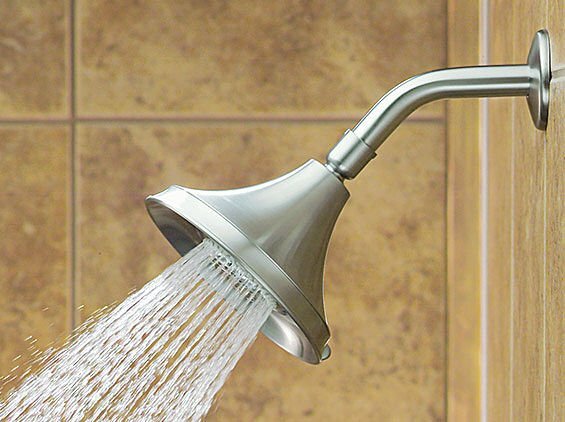 It’s not just kids, some adults need to take more frequent showers, too. You know what I’m talking about… you walk by someone and the smell hits you about 10 seconds after you pass. Please, take a shower. We get dirty. There’s not a whole lot that we can do to prevent that. Our bodies need regular cleansing and if we don’t do it, we stink. I wonder why God made us that way? He could have just made us smell better over time. But no, He made us smell when we don’t bathe. Maybe He did it to give us a picture of what happens spiritually when we don’t bathe. When we let the dirt of life hang on us we start to stink spiritually. If we don’t shower in His mercy and forgiveness, we really start to reek. In Zechariah 13, the Lord promised that He was going to open up a fountain that the people could get clean in. But it wasn’t physical dirt that needed to be washed away; it was spiritual. He was going to raise up a fountain that would cleanse them from sin and impurity so that they could be clean before Him. That fountain? Jesus. When we shower regularly in His grace, we can stand before God unashamed. We don’t have to worry about the filth on our life or the smell coming from our sin. We can run to the fountain and wash it all away. These days, my kids don’t really like to take showers. We tell them that someday that will change. There will come a day when they look forward to a hot shower in the morning. They will grow to appreciate the smell of clean. They will want to wash away the dirt from yesterday. But for today, dad has to remind them to do it. And today, your heavenly Father is reminding you to do the same. Go to the fountain and let Him wash over you. *Do you need a spiritual shower? Right when you think it’s going to be no more Mr. Nice Guy, David comes out with this extreme act of kindness. The house of Saul has been mostly destroyed, but David really wants to show kindness to the former king’s family. And wouldn’t you know it, the only guy left was a son of Jonathan. That worked out well. This guy’s name was Mephibosheth. Say that 5 times fast. Actually, try saying it one time fast! He also didn’t pour out extra kindness because of his handicap. He didn’t treat him funny or ask if he wanted to be carried. He didn’t feel sorry for him or treat him like a charity case. He didn’t stare at those feet, causing Mephi to ask, “what you looking at! ?” You know what he did? He treated him like a human being. His physical ailment didn’t change what he wanted to do: bless an heir of Saul. So he blessed him. We get so hung up sometimes on the condition of people we are trying to help. We look at their appearance and determine how much we can help them. We look at their lifestyle and decide if they are worth our time. But we must keep in mind that Jesus didn’t come to give them a shower and get them all cleaned up; He came to clean up their hearts. He came to the poor and to the wealthy. He came to the disabled and to the physically strong. He came for humanity and He sends us out to that humanity to show His love. We have much to learn from David today. He was a man who, like the Lord, looked at the heart of the man rather than the condition of his feet. Forgive me for titling this entry, “you’re an idiot.” Hopefully that doesn’t offend you. Quite frankly, there were no other words to describe what I was feeling about these two guys who killed Ish-Bosheth. Their names were Recab and Baanah and they were thugs. They thought they were pretty amazing for killing Ish-Bosheth and marched off to take the great news to David. There are lots of things that bothered me about what they did, but two things really stick out. First, they did it for their glory. Imagine their thought process: they would be the ones who handed Israel over to David. They did the dirty job that no one wanted to do so that David could become king. Imagine their dreams of glory. I bet they expected to be praised and promoted, too. David would surely put them in charge of his armies. Secondly, they brought God into their wickedness. They tried telling David that the Lord had avenged him against all the wrongdoing that Saul had done to him. What in the world? Bringing God into your sinful decisions is never a good idea. Justifying your wrongful actions in His Name is downright shameful. So what happened to these thugs? Did they get their glory and their fame? Did God shine upon them and pour out His blessings for killing Ish-Bosheth in His name? Not even close. David looks at them and basically says, “you’re idiots.” Then he kills them. You see, God doesn’t need help with justice. He doesn’t need His people to repay evil with evil. He has called us, the church, to love the world. Injustice happens – it’s true. But we must be content with God giving us our blessings and God dealing with those who persecute us. 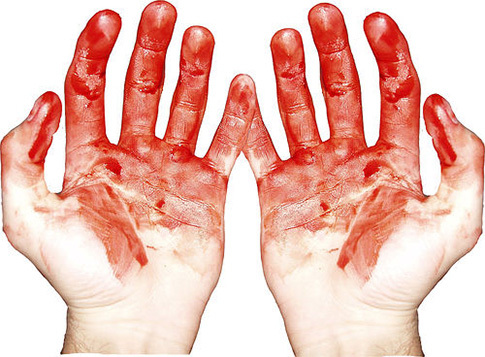 For if we are to stand clean before Him, we probably shouldn’t have blood on our hands.